Members of the Distribution Contractors Association (DCA) continue to be forced to enroll in the “Gold Shovel Standard” (GSS), a certification and monitoring program conducted primarily in the gas distribution industry. While the goal of increased damage prevention is one that DCA members have striv..
Pilots shout out “clear” to warn anyone they might not be able to see around their plane and to stay away from the propeller. While some pilots starting up their planes at Frasca Field, a privately owned, public-use airport located at the northern edge of Urbana, IL, might have seen men and equipmen.. When dealing with a construction site that is underwater or where the water table is just above sea level, contractors have to ensure that the excavation stays dry and safe for workers. This can be extra challenging where you have conditions affected by water depth, and conditions such as silt and s..
By Drexel University and the University of Pittsburgh Researchers at Drexel University and the University of Pittsburgh have found, through risk assessment modeling, that sewer workers downstream of hospitals that are Ebola treatment centers could be at risk for exposure to the virus – a considerat.. The Lower Neches Valley Authority (LNVA) is one of the 23 River Authorities created by the state of Texas to develop and manage the waters of the state. The LNVA is responsible for fresh water management in far southeastern Texas in the entirety of Jefferson, Hardin and Tyler Counties, and portions .. The Distribution Contractors Association (DCA) and American Gas Association (AGA) held their third annual Utility Contractor Workshop at the Four Seasons Hotel in Chicago on April 18-19. Since the first joint workshop, the event has expanded both in attendance, as well as the scope of issues address..
By Daniel Shumate Director, FMI Capital Advisors Inc. EDITOR’S NOTE: The past 25 years have seen many changes in the underground utilities universe. Technology advances, regulatory activity and environmental requirements have dictated major alterations in the way companies are managed. Rating as on.. 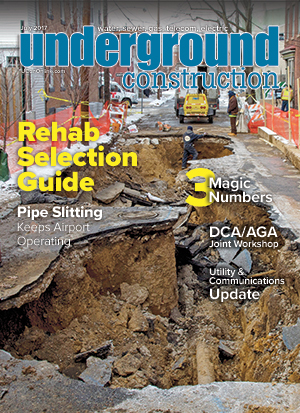 When Corinthian Contractors was awarded a subcontractor bid in late 2015 to do excavation, material hauling and placement service work during phase two of the Dulles Corridor Metrorail Project, owner Jamie Doll knew he would need the right mix of construction equipment to efficiently complete the jo..
McLaughlin revealed a new line of underground utility locators. The Vision locators combine proven McLaughlin technologies to ensure accuracy with new features to help contractors find underground utilities more efficiently. The Vision product line includes three models: the LX for utility contract..
Vortex Infrastructure, a leader in civil infrastructure trenchless solutions, has established a strategic alliance with Salt Lake City, UT-based Stag Technologies, a manufacturer of epoxies, urethanes and other 100-percent solid specialty coatings for the municipal and industrial marketplace. This .. The latest generation of RIDGID hand-held inspection cameras is purpose-built to help inspect, locate and diagnose issues faster than ever. The Micro CA-150 and Micro CA-350 Inspection Cameras are for professionals working in tough environments who require the latest technology for quick job-site fe.. This month, NASSCO honors Mark Metcalf who epitomizes the association’s commitment to serving the industry in a positive manner. My original career plan was to get into real estate. I received my bachelor’s of science degree in business administration from Arizona State University in 1973, but inst..
Take a moment and flip back to read the title of this magazine. It’s Underground Construction, and deals with – well, underground construction. Water, sewer, gas, telecom and electric; that pretty much covers all the bases. It also covers a lot of miles. According to the Common Ground Alliance, ther.. The House committee with authority for approving drinking water infrastructure funding has begun a legislative effort to reauthorize the 1996 law which created the Drinking Water State Revolving Fund (DWSRF). Rep. Greg Walden (R-OR), chairman of the House Energy and Commerce Committee, said both Rep..
CASE Construction Equipment dealer Titan Machinery donated the use of two excavators to Team Rubicon for a service project and training event at the DeSoto National Wildlife Refuge in Iowa and Nebraska. The excavators – a CX210C and CX250D – were used to remove several levees and water culverts as p.. The Texas Water Development Board (TWDB) has approved by resolution the following financial assistance: $330 million, consisting of a $220 million multi-year loan from the Drinking Water State Revolving Fund (DWSRF) and a $110 million multi-year loan from the Clean Water State Revolving Fund (CWSRF..
Several environmental groups are suing the Virginia Department of Environmental Quality over part of the permitting process for two proposed natural gas pipelines. The Dominion Pipeline Monitoring Coalition, Bold Alliance and Preserve Craig Inc. filed suit this week in Richmond Circuit Court. They’..
Industry-veteran Jason M. Goldstein will formally assume the role of executive director of the INGAA Foundation, upon the August 31 retirement of Richard Hoffmann. As executive director, Goldstein will be responsible for managing the Foundation’s technical and economic studies, implementing its str.. The Plastics Pipe Institute (PPI), the major trade association representing all segments of the plastic pipe industry, has renamed its Conduit Division as the Power & Communications Division (PCD). This change was prompted by growth within the division, uses of conduit in rapidly developing applica.. Pipe and hardware companies should benefit from heightening concerns about U.S. municipal water infrastructure and $300 billion of forecasted capital expenditures over the next decade, according to a new report from Bluefield Research, U.S. Municipal Pipe Markets: Trends, Opportunities and a Changin.. Continuing its long-standing tradition of hosting world-class short courses in underground construction and tunneling, the Colorado School of Mines is offering “Tunneling Fundamentals, Practice and Innovations,” Sept. 18-21, in its facilities at the Golden, CO, campus. With industry experts serving..
by Robert Carpenter, Editor-in-Chief Change embraces our world every day, every month, every year. It is one of the few constants in our lives. Change will happen whether it be in small ways or major disruptions. But it will happen. The only question is when. For Underground Construction magazine ..